Wandsworth - We can’t go over it! As the final weeks of summer begin to draw in we’ve had days of summer rain followed by spectacular sunshine. As always, the rhythm of our days and opportunities for play is influenced by the weather and this week has been no different. We have marvelled at how well our young Forest Folk have learnt, respected and understood the site boundaries from the rainbow ribbons since they have settled at Wandsworth. 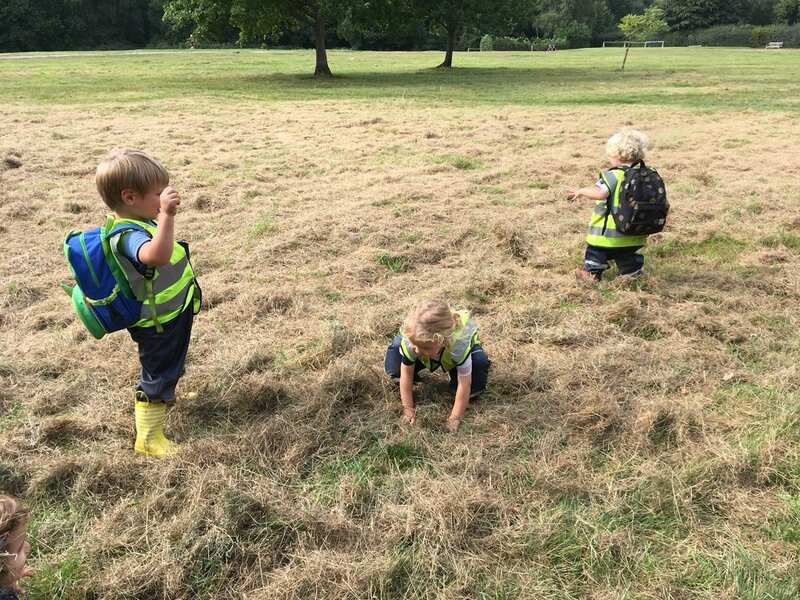 Just this week we’ve had two year olds who have articulately explained our rules about site safety; ‘If you see a rainbow ribbon, you stop, turn around and come back!” and when asked to explain why they have told us ‘So we are safe’ and ‘so we look after everyone in the forest!’. Now this rule feels so embedded we have been able to confidently brave the world beyond the ribbons in regular adventure walks. This week our adventurous children decided they didn’t want to stick to the paths of Wimbledon common- oh no! These young explorers went off the track and into the wild woodland, steep hills and undergrowth. Problem solvers that they are, the resounding (somewhat innovated) phrases from We’re going on a Bear Hunt echoed through the forest “Uh Oh! We can’t go over it! We can’t go thought it! We’ve got to go under it!” Each challenge of a fallen tree, overgrown brambles or steep incline were met with enthusiasm and supportive words between friends. “Follow me! This way! You can climb this way too!” they shouted to one another, smiles adorning their faces. We’ve been so impressed with the children’s growing relationships between one another and a sense that they are united as one- they work together as a team and see each other as a little family. Every morning as we walk down to our forest site on Wimbledon common they children always remind us to say good morning to the reliable green tractor who sits by the Ranger’s house. But one morning this week, what excitement we were met with, the green tractor had found a new friend- the red digger! It seemed only polite that we should go and introduce ourselves to the pair. The children were fascinated by the size and strength of the wheels and the tools attached to the vehicles. We were then met by the Common Ranger who told the children all about the hay collecting for our lovely friend Percy the horse. After establishing that the hay was for animal feed in the winter the children then put it to good use with some hay showers, spontaneously throwing it high into the air before gleefully watching it fall all over their heads! Another sign that the end of summer is approaching and autumn is nearly upon us are the plentiful spiders weaving their webs in every opportune space around us. The children have been fascinated by the glittering threads hanging from the trees. So one morning the children arrived in the forest to see that a child sized spider web had been spun between the trees. The children ducked, stretched, climbed and tangled themselves within the web. “I’m a hungry spider waiting to catch a bumble bee!” they declared. Once the victim was caught he lay very still, trapped by the rope web. Whoever knew our little foresters could be so still for so long?! As well as the spider role play, the introduction of more rope constructions this week has led to an interest in knots and mathematical language around shape and space. We have been bowled over by the children’s physical ingenuity with these games. Thank you all for a very happy week in the forest. Newer PostWimbledon - The Mud kitchen came alive!